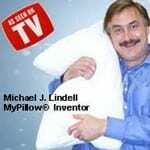 Pillow Reviews – Which Ones Really Work? Finding the perfect pillow is paramount to getting a good night sleep, and pillow reviews can help. If you have a pillow that gets too hot, you’ll end up flipping it multiple times per night. 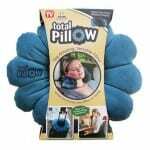 If you have a pillow that is too soft, you’ll wake up with a stiff neck. 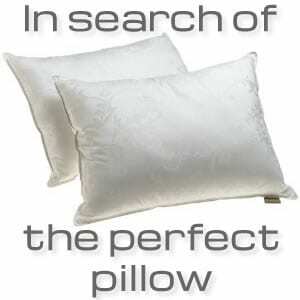 If you have a pillow that’s too firm, you’ll toss and turn not being able to find a comfortable position. Lots of companies have stepped up with an array of pillows to fix this dillema, and we’re doing our best to sort them out for you. Sleeping preferences are like snowflakes, no two are exactly same. Some people just like one pillow, while others can’t get to sleep unless they have two or three. Some people sleep on their side, others on their back, and still others on their stomach. Each of these positions will require a different sort of pillow, or at least a different positioning of the pillow. There’s no one right way to sleep, so it’s all about finding products that dovetail nicely with the way you already like to sleep. Pillows are pretty personal items too, and we each have our own pillow. Perhaps the only more personal item is a toothbrush. You don’t want to share your pillow, and you wouldn’t want to use anyone else’s. All of this combines to make this a rather personal purchasing decision, and one that you don’t want to get wrong too many times as it takes a direct toll on your quality of sleep, and essentially your quality of life. So take these pillow reviews with a grain of salt, knowing that you have the ultimate say in what works best for you. The new Sobakawa Cloud Pillow is not like the original, but still maintains a lot of the same characteristics. It’s made out of foam beads instead of buckwheat hulls like it originally contained. The point of using these natural hulls is that they don’t trap and hold heat in the pillow, allowing you to sleep comfortably for hours without having to flip your pillow to the “cool side”. This is the pillow where they show a bowling ball dropping onto it and it protects the egg beneath it. While this is an impressive show of its impact neutralizing ability, it really doesn’t say much about how comfortable the pillow is. The real magic is how the beads conform to the shape of your head and also how well that maintain their shape. 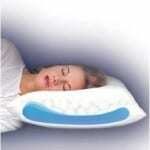 The Mediflow corporation makes ergonomic sleep aids, and their Waterbase Pillow is one of their best sellers. The idea is that by allowing you to fill it up to your desired firmness, you have lots of control of how it feels. Too firm you just let some water out, not firm enough you add more to it. They say that this allows you to find the balance between comfort and firmness, too traits that are typically at odds with each other. We analyzed this pillow up and down and took into consideration the feedback it was getting from actual users. We decided to give it our Thumbs Up, but you should check it out and see for yourself what you think. MyPillow is the brainchild of one man, and they make some rather big claims in it, saying it treats all sorts of things from asthma and allergies to the controversial fibromyalgia. It’s risky business saying something as simple is a pillow can turn your life around and cure a bunch of different ailments. On the surface it doesn’t look like MyPillow is much different than an ordinary pillow. However, we went deeper than that to find out what people are saying about this pillow, and whether or not they feel it was worth buying or not. Most pillows out there are designed for your bed, but Total Pillow is one of the few out there that pitch themselves as being your all around go-to pillow. It twists and bends into plenty of positions so you can use it while you’re traveling, or while you’re working at your desk at the office, and they even suggest using it while you sleep in your bed. While we were a little skeptical of some of the uses they came up with, it turns out this little pillow comes in handy a lot of the time. The best way we found to use it was to fold it in half for use on long bus and plane rides. This is a buckwheat pillow in a similar style to the Sobakawa pillow reviewed above. It also boasts that it keeps your head cool. The Japanese way of sleeping is to have a cool head and warm appendages. They say this is the best way to sleep and will give you the most rejuvenating sleep. An easy way to accomplish this is the make sure your pillow doesn’t retain heat, causing you to wake up in a sweat at night. If you’re in the market for a pillow like this, make sure you compare the Watanabe pillow to the Sobakawa pillow by reading each of our reviews. EuroCozy doesn’t mess around, they say hey, if you’re going to get some rest there’s no sense in being bashful about it. The system basically involves setting yourself up in your own little cocoon of comfort. The pillow that it comes with attaches around your neck so it doesn’t move around, and they even have support for your arms so you are tight and secure on plane trips. But is this set up worth all of the fuss, or can you get by more easily with something like the Total Pillow for your sleeping-while-traveling needs? A blanket, a pillow, backpack, and a stuffed animal all rolled into one. 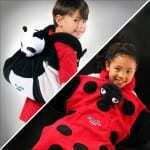 That’s the concept of this hybrid toy known as BlanKid Buddy. It seems like it combines 4 things that kids are going need and carry around anyway, so it’s easy to see why this would catch the eye of a parent. But will kids actually use it, or will it collect dust? As it turns out kids seem to really like it, and parents have reported that it’s made well and lasts through extended use. Find out what else they had to say in our full review. Getting your pillow right is just part of the perfect sleep puzzle. There are several other factors you should consider when trying to get the most restful sleep possible. If your bed is the culprit of your tossing and turning, you should look into your different options for that, including mattress toppers. They’ve really come a long way, and now you can basically get a new bed for a fraction of the cost of expensive beds with a high quality mattress topper. Another way to improve your sleep is to get comfortable bed sheets. There are many different options when it comes to these, so you’ll have to check out different thread counts and fibers to see which ones you think will help you sleep. Some of them, like Egyptian threads, are too silky for some people, while others like flannel sheets can generate too much heat while you’re sleeping. You might even have to experiment, or use different sets of sheets depending on the season. One thing that many people don’t relate to sleeping is the air quality. Since this is 8 hours of breathing you might want to think about investing in a good air cleaner and purifier. This can make a great difference if you usually wake up with a stuffy nose, or if you’ve been known to experience allergic reactions when you try to sleep, like sneezing or wheezing. The foods you eat and the lifestyle you lead are also major contributors to how well you’ll sleep. If you’re active and exercise regularly you should be able to sleep better at night because you’ve worn yourself out during the day. If you lead a more sedentary life, or watch a lot of television, you might find yourself overstimulated when you close your eyes to try and sleep, and you might blame your pillow or your bed for your inability to fall asleep when it’s bed time. Laying off the caffeine towards the end of the day is always a good idea. Also, avoid eating heavier meals for dinner, and skip late night snacks as these can go undigested and leave you awake with stomach trouble. If you’re a habitual snorer you should consider finding a product that will help you stop. Many people who snore end up stopping breathing in the middle of the night, and this can have a big effect on how you feel the next day. You might not be tossing and turning, but eventually you’ll wake yourself up in order to breath and this constant cycle can be really draining, and can also lead to other health complications. We’ve reviewed a few snoring aids including zQuiet and My Snoring Solution. As you can see the problem of a good night’s sleep is a comprehensive one, and you should take a multi-angled approach to it. Starting with the pillow is a good idea, as this can get you the most bang for your buck and can offer a lot of relief right away. As you start to incorporate new products and sleeping techniques you should notice an increase in the quality of your waking hours. Pillow reviews will only get you so far, it’s going to come down to some trial and error, and perhaps buying a few duds along the way.